Onye Onyemaechi’s events for the week of April 23 – 29, 2019. Tuesday, April 23 – 7:00 p.m. to 8:30 p.m. The Oasis at Carr Mill in Carrboro, 200 N. Greensboro Street (www.oasisincarrmill.com/) World Musician and visionary author Onye Onyemaechi will bring us together in a celebration of life and building community for personal and global transformation. He is gifted with the ability to perceive the imprint of past thoughts, trauma, emotions and relationships and their effects on our soul’s memory. He is a channel of divine energy and wisdom which is transformative for the individual. Come and listen to him speak and drum. He will be taking appointments for private sessions at this time. 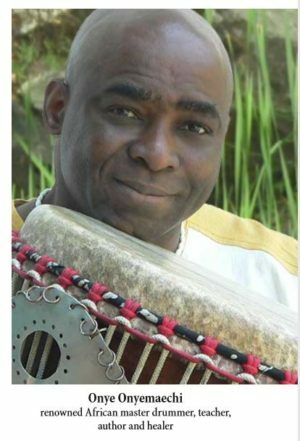 Join Onye Onyemaechi, world renowned Master Drummer, dancer, healer and author in this community event focusing on the experience of “transdrumming” as a mechanism for individual spiritual awakening, deepening, healing and collective community building. Bring your drums and other percussion instrument and wear comfortable clothing. The donation for this event is $25.00 in advance and $35.00 at the door and you must register by calling Kevin Wilson, 252-908-0577 or emailing him at st.annes.oakgrove@gmail.com. Psychic perception engages subtle senses that we perceive beyond the physical body such as to see, hear, touch and feel. These subtle senses are considered extra sensory perception, intuition or psychic abilities. They are aspects of our soul body and higher consciousness but on a subtler energetic level. Onye will address the effect of psychic abilities’ connection to spiritual awakening and development. This is a great opportunity to exercise and explore the supernatural world and its effect on our daily lives and relationship with our world. A donation of $30.00 is suggested. You must register for this event by calling Pam Mailloux, 336-376-9534-home, 336-317-7198-cell or emailing at rammp43@triad.rr.com. In traditional societies music and spirituality play vital rolls in a historical context. 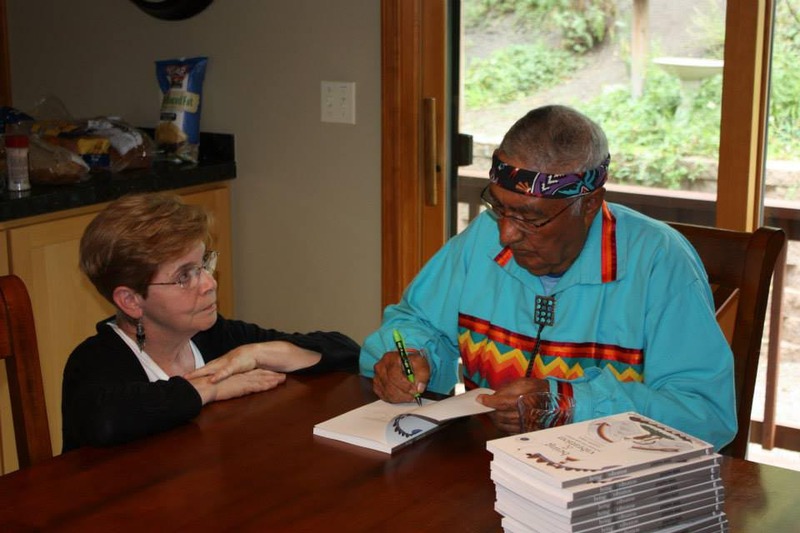 Special practices take individuals within to experience the reality of their own story. Using the drum to tell your story will completely change your perspectives on personal and societal healing. It will prepare and empower you to take steps to significantly improve your situation and condition. In this workshop, participants will learn simple techniques to journey, heal, and celebrate the soul memories we carry through the use of powerful prayers and rhythms. Together, we will tap into the endless reservoir of the Sacred revealing truth through direct communication. A donation of $45.00 is suggested. You must register for this event by calling Pam Mailloux at 336-376-9534-home, 336317-7198-cell or rammp43@triad.rr.com. 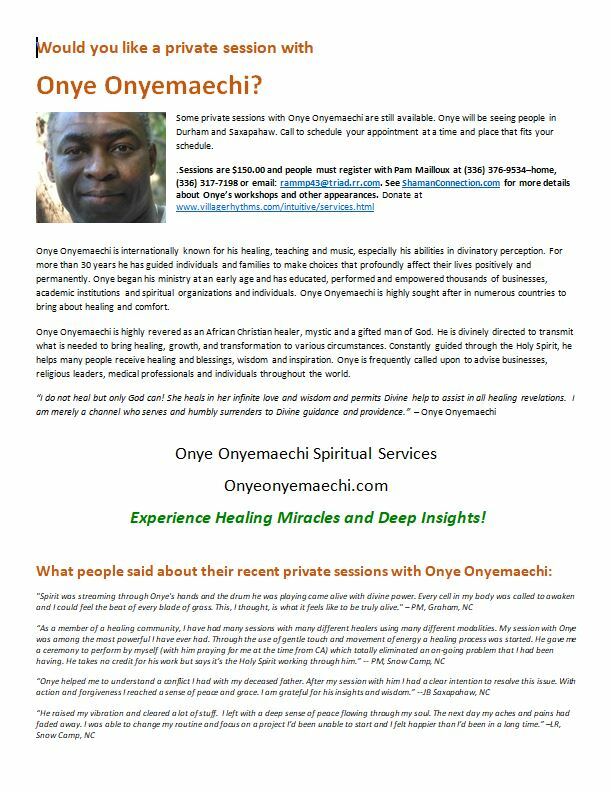 Onye will be conducting healing sessions in Saxapahaw and Durham. 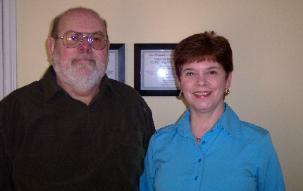 Healing sessions are $150.00 with discounts for seniors and students. You must make an appointment with Pam Mailloux at 336-376-9534-home, 336-317-7198-cell or emailing at rammp43@triad.rr.com. See: http://www.onyeonyemaechi.com and http://www.villagerhythms.com for more about Onye. Visit Shaman Connection on Facebook. We hope to see you at these rare East Coast events with Onye!